The old walled city of Manila, the Intramuros, has always held a certain fascination for Manileños. It displays the architecture of the Spanish colonial period and has that atmosphere of the laid back, horse and buggy days of the early 20th century. However, its history started with Fort Santiago, the main defense to the port of Manila. How lucky we are that of all the beautiful landmarks that have gone by the wayside in Manila, there has been a concentrated effort to restore and save this historic portion of “Maynila”. 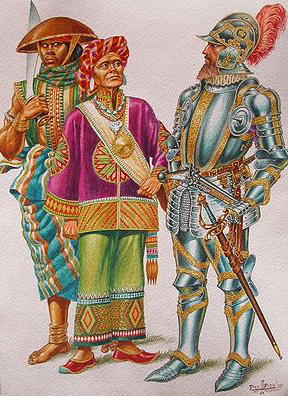 On 19 May 1571, Miguel Lopez de Legazpi and his troops occupied Rajah Sulayman’s village. 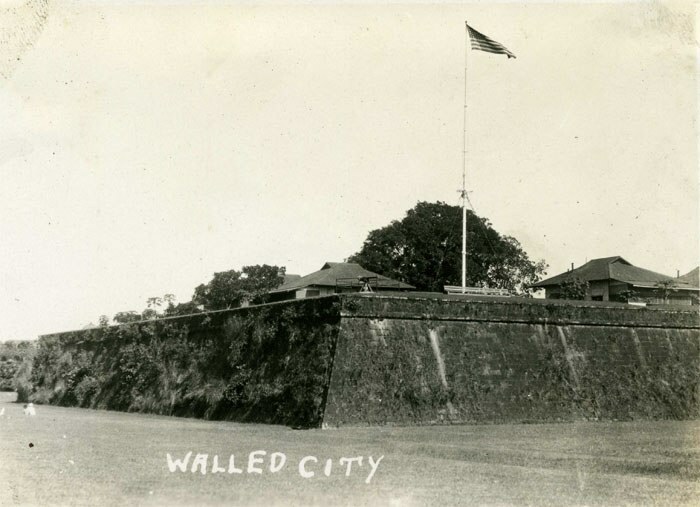 They took over the palisade (kuta) in which the Rajah’s residence was built. That year, Manila was constituted a city of the Spanish realm, formalizing the occupation of the city. Temporary fortifications at the site of Sulayman’s palisade began as soon as the Spanish took charge of the settlement. 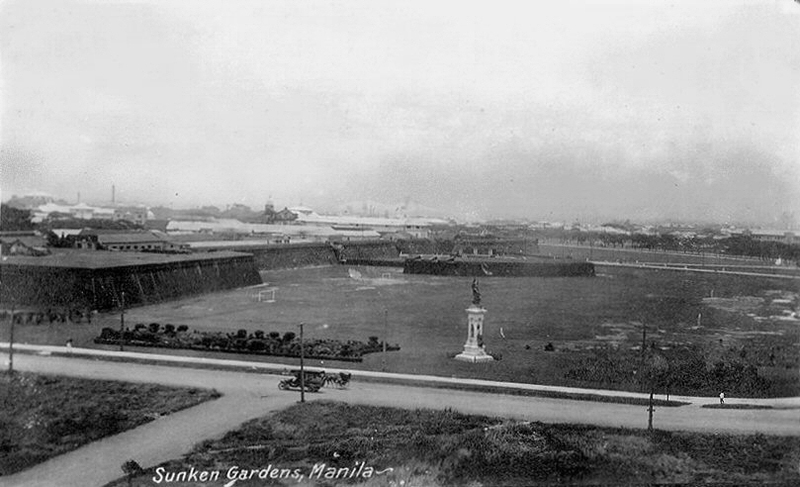 They started building Fort Santiago (Fuerte de Santiago) after the establishment of the city of Manila under Spanish rule on June 24, 1571, and made Manila the capital of the newly colonized islands. The first fort was a structure of palm logs and earth. Most of it was destroyed when the city was invaded by Chinese pirates in 1574, led by Limahong. 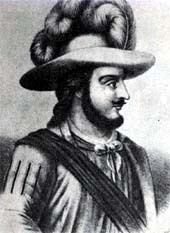 After a fierce conflict, the Spaniards under the leadership of Juan de Salcedo, eventually drove the pirates out of the country. 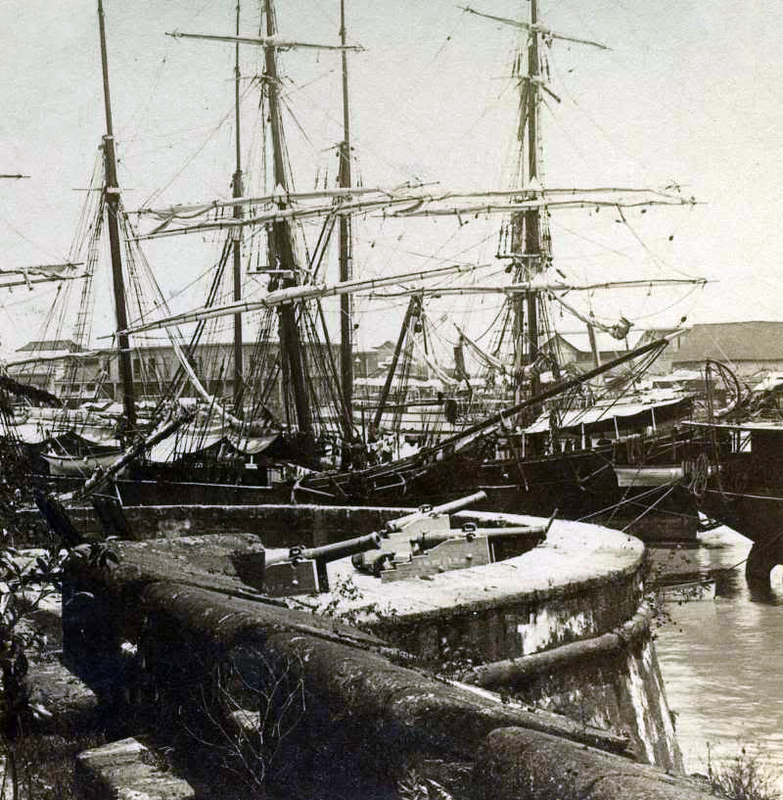 The Spanish colonials brought to Manila their rich experience in stone construction and urban planning. 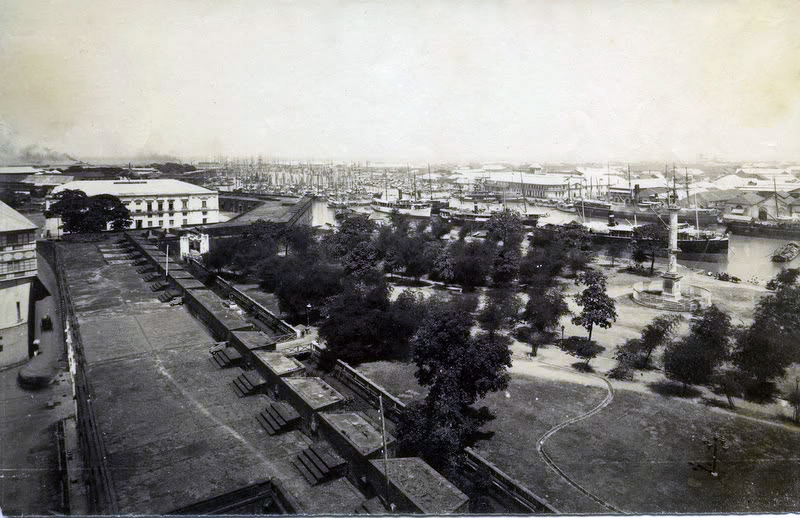 The early plans of the city of Intramuros were shaped by its location surrounded on two sides by the Pasig River and the Manila Bay and included a central plaza with the focus on the cathedral and government buildings. 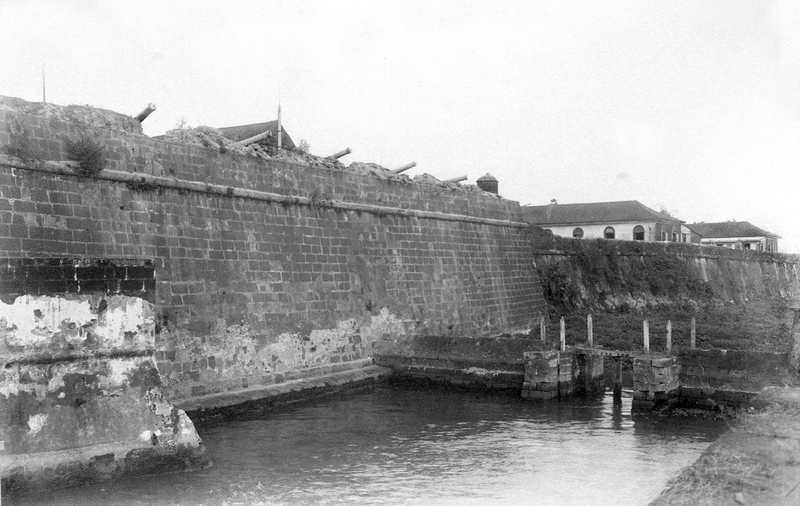 Importantly, it maintained a strategically defensive position at the mouth of the Pasig by the old wooden fortification. 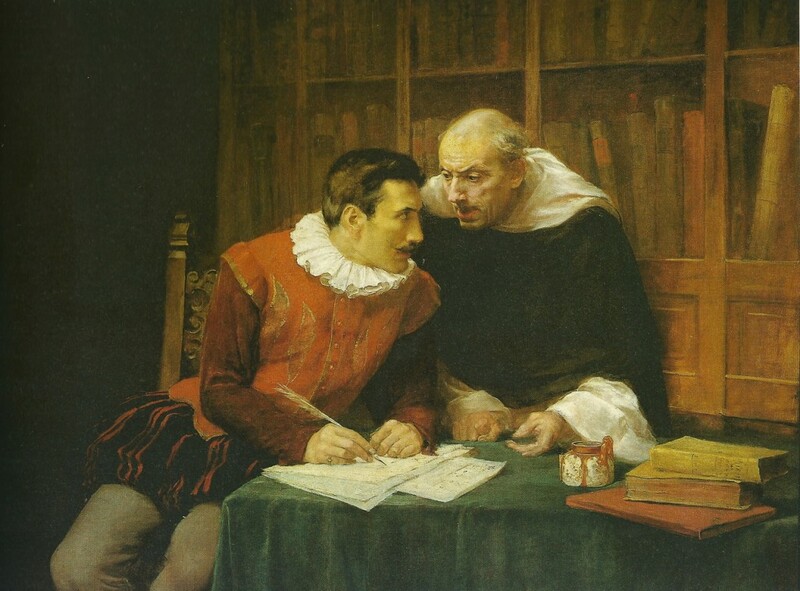 The first architect of Intramuros was Antoñio Sedeño, a Spanish Jesuit, who in the 1580s, provided guidance in design and construction of buildings in Manila along traditional Western influences. 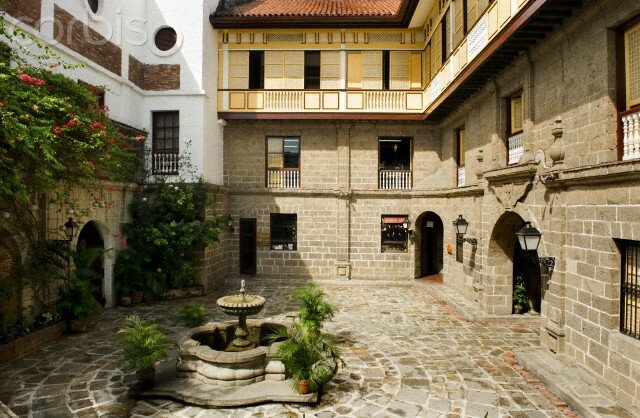 After designing the impressive residence of Manila’s first Bishop Salazar (1580-1594), he started reconstructing buildings into bahay-na-bato (stone houses) that gave Intramuros its monumentality and grandeur. Courtyard of Casa Manila, a reconstructed example of Bahay na bato. Father Sedeño drew the plans for the fort himself and directed the construction by showing the natives and Sangley (Chinese) laborers how to quarry stones, finish and lay them. The stones used were consolidated volcanic ash quarried from Guadalupe (now Guadalupe Viejo in Makati). 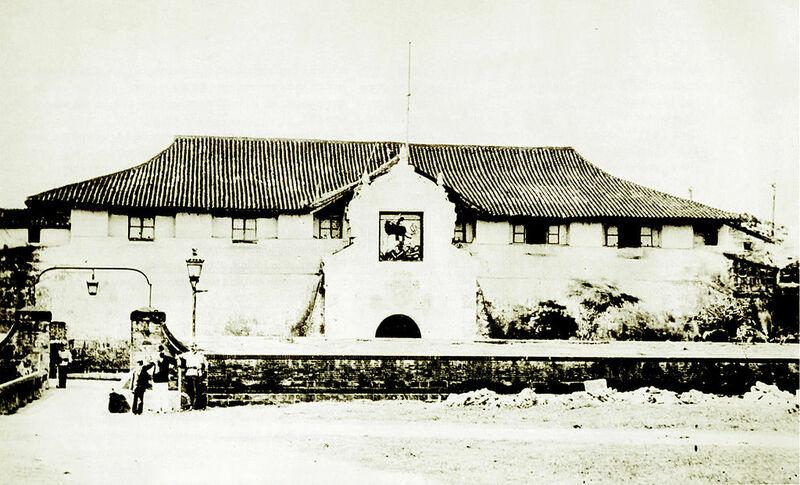 The construction of Fort Santiago with hard stone, together with the original fortified walls of Intramuros, commenced in 1590 and finished in 1593 during the reign of Governor-General Gomez Perez Dasmariñas. In 1591, there were some three thousand Chinese in the islands, two-thirds of whom lived in the Chinese Parián Quarter (about where the Post Office and Metropolitan Theater stands). The Sangleys were the merchants, laborers and artisans of the Spanish period. Think of them as the first OCWs (overseas Chinese workers) who hoped to earn enough money to provide for their families back home.The presence of these excellent Chinese artisans and skilled laborers in the Chinese Parián proved most helpful in building fine houses and buildings of hewn stone at a low cost and in short construction time. 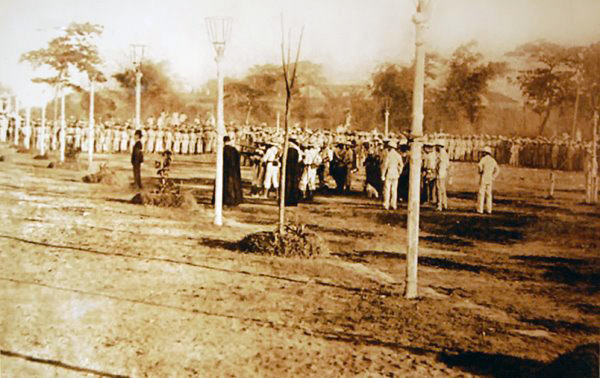 Governor Dasmariñas on the left. Governor Dasmariñas (1590-1593) brought with him royal decrees that led to one of the largest building projects ever to be realized in the city and which finally enclosed it with stone walls and principal gates. Under him, the construction of Fort Santiago was finished. Thousands of native Filipinos and Chinese were forced to work in quarries, to manufacture bricks and roof tiles, and to cut wood. 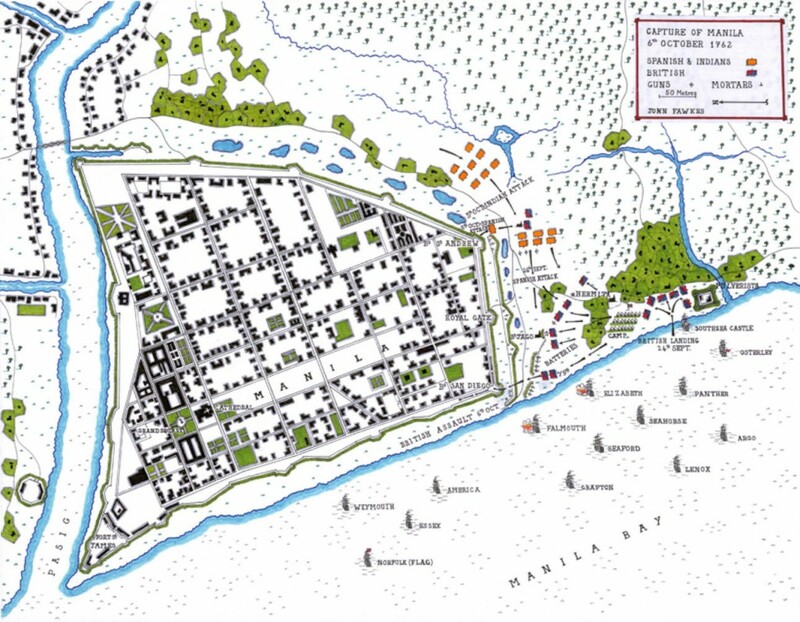 In 1590, Leonardo Turriano was sent to take charge of supervising and designing the construction of the city. With the enthusiastic support of Gov. Dasmariñas, he finished the construction of Fort Santiago, Parian Gate and its Ravelin, and completed 2 kilometers of walls. The old wooden fort was made into a stone bulwark (baluarte) with a castle called Castillo de Santiago. Additional forts like Bastion de San Gabriel, Bastion de San Fernando, and Bastion de San Andres were constructed facing the surrounding land, while Bastion de San Diego, Bastion de San Jose, and Bastion de San Eugenio were directed toward the sea. 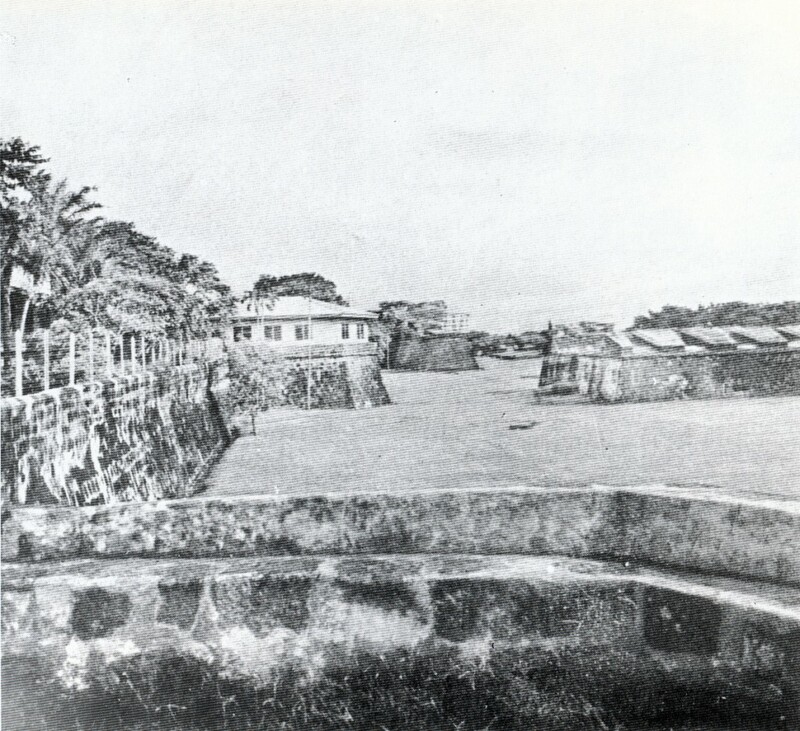 As additional defense, a moat was dug that was filled with seawater from the incoming tide by means of watergates, which later proved to be a tool used in torture and execution. 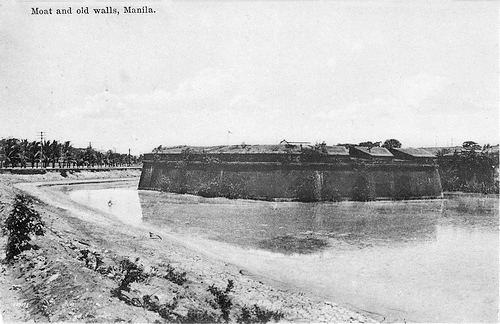 Moat surrounding Intramuros during the Spanish era. 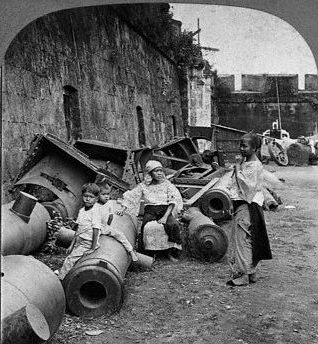 Cannons protecting the entrance to the Pasig. Watergates control the level of water in the moat. The above photo presents the watergates which regulated the level of the moat. They led from the Pasig River, one by the fort and other by Bastion de San Gabriel. A view towards Manila Bay with the Magellan monument on the right. 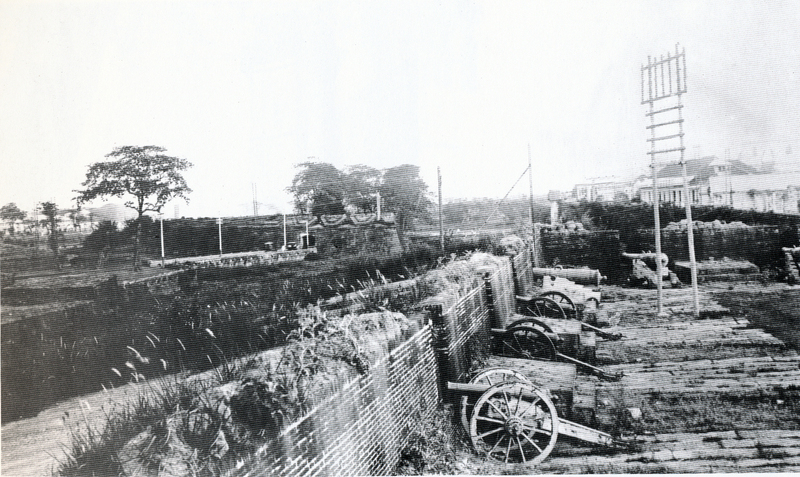 The photo above taken in 1898 shows the cannons carefully aimed at the Chinese Parian Quarter (about where the Post Office and Metropolitan Theater now stand). They swept the expanse of the wall toward Bastion de Dilao straight ahead and the Bridge of Spain on the other side. 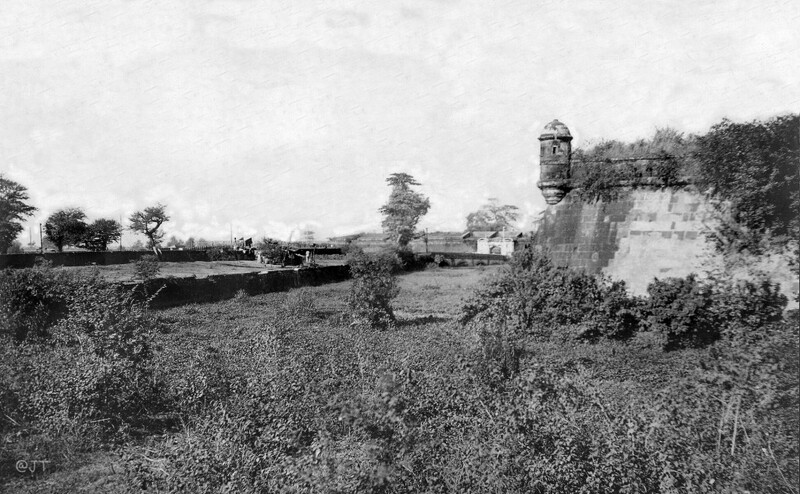 The above photo taken from Bastion de Eugenio shows the other two bastions. 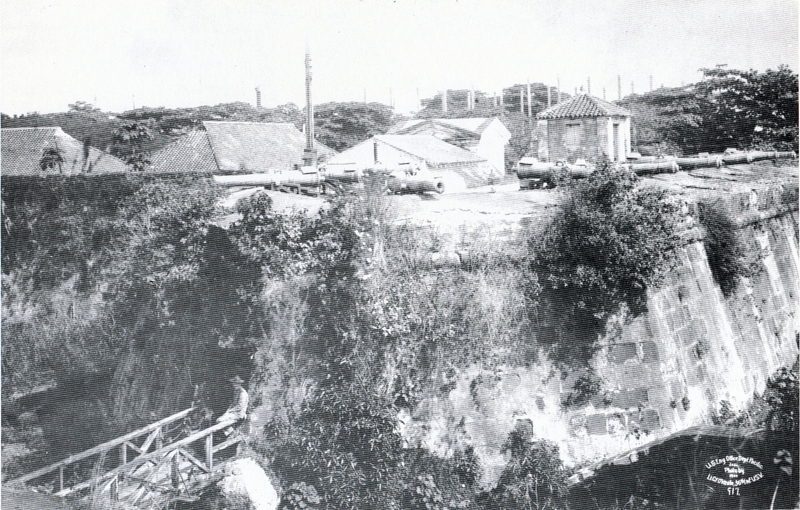 The house above Bastion de San Jose was Gen.MacArthur’s pre-war headquarters. In the ensuing century, not much was done in the way of maintenance or improvement of the old city. In the 18thcentury during the reign of Charles III, after several threats to Manila’s security, including the attack and occupation of British forces in 1762, additional fortifications and plans for repair and maintenance were instituted upon return of Spanish rule in 1764. Manila after the battle of 1762 with Britain. In the next span of over a hundred years, many engineers were tasked to perfect the walls, gates and bulwarks which made Intramuros the best fortified city in the Orient however, the work was executed at different times and often there were many years between. The inevitable result was that no uniform plan was followed in the execution of the work. This is seen in the variety of materials used and in the number of different systems of fortifications employed. Below, photos of the filled moat, now seeded and greened as the Municipal Golf links. 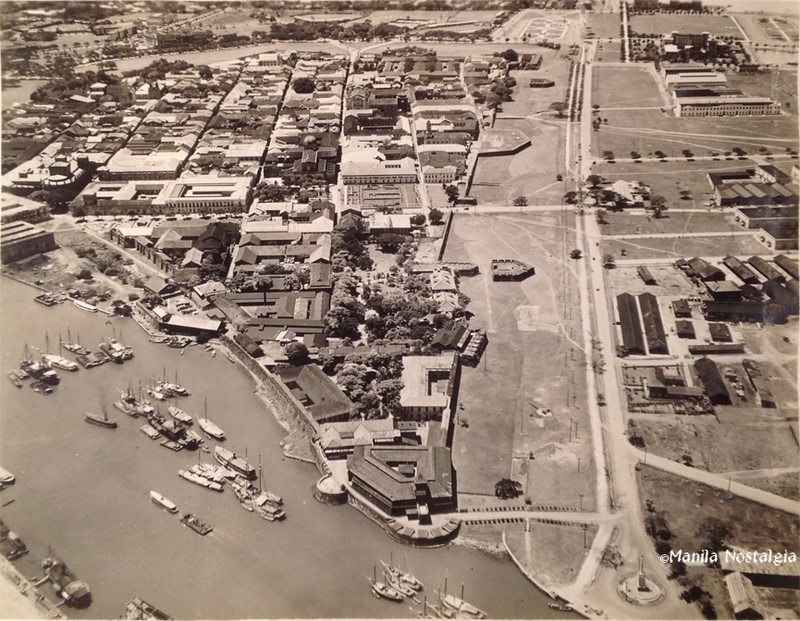 A prewar aerial view of Fort Santiago with Calle Bonifacio on the right going north and south, and the Anda Monument below right (today called Bonafacio Drive where the Roxas Bridge spans the Pasig). 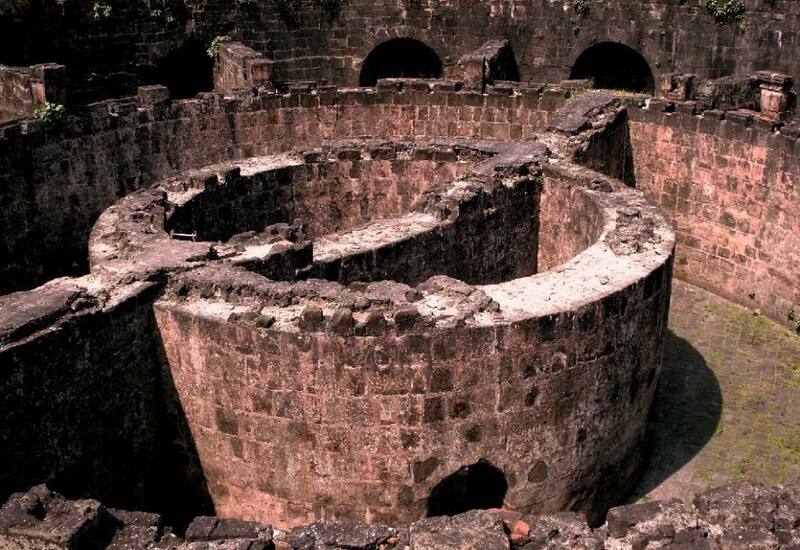 Baluarte de Santa Barbara, built in 1593, is a stone bastion that forms a part of the Santiago Fort in Manila. Formerly a storage house of ammunition and arms, it was later converted into a prison. Stories of torture and death were told of the Japanese and especially the Kempei Tai occupation of Fort Santiago during the war years. 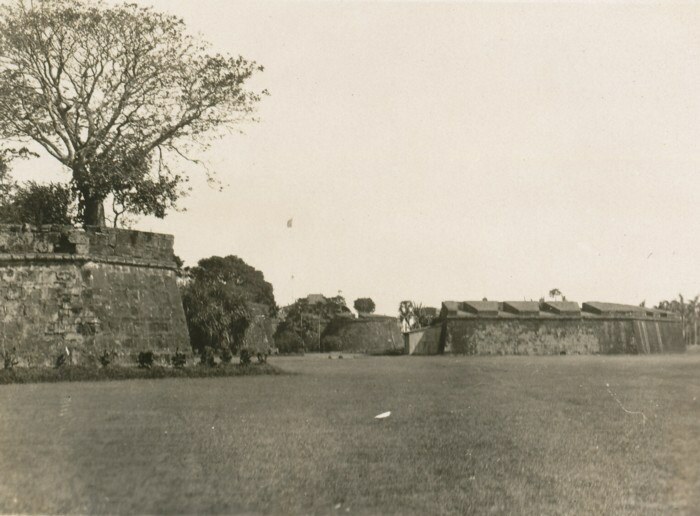 Baluarte de San Diego, designed and built by Jesuit priest Antonio Sedeno from 1586 to 1587, it is one of the oldest stone fortifications in Intramuros. It began as a circular fort called Nuestra Senora de Guia, then renovated in 1593 to join the walls of the city. In 1644 construction began for a new baluarte which was completed in 1663. The baluarte was breached by British forces with cannon fire in 1762. It was restored and strengthened after the British occupation but was damaged again during the 1863 earthquake. It was destroyed during the Battle of Manila in 1945. Restoration began in 1979 and completed in 1992. 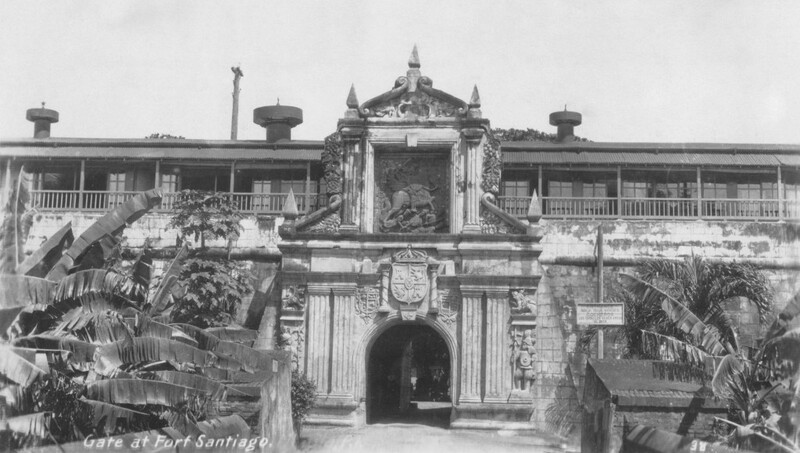 Fort Santiago was named after Saint James the Great (Santiago in Spanish), the patron saint of Spain. 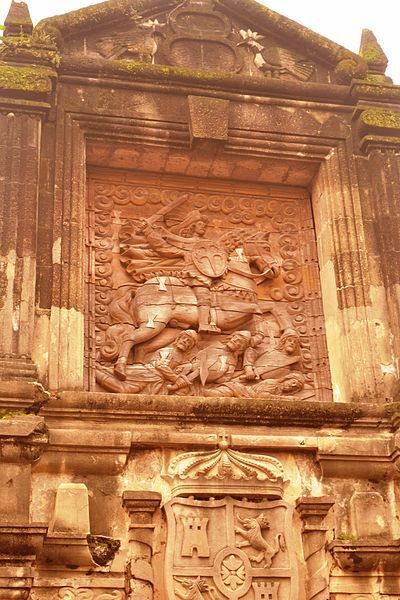 A wooden relief sculpture portraying Saint James slaying Moorish enemies decorates the fort’s main gate and below it is the seal of Spain. Photo below left, probably taken around 1900, you’ll note the relief and below it, the seal of Spain is practically gone with a six-sided star imposed over it. The meaning of this star seems to be a mystery as it was removed when the gate was reconstructed. In the photo below, the reconstruction has been done to the relief and seal. For a beautiful 360 degree view of the main gate, please click here. 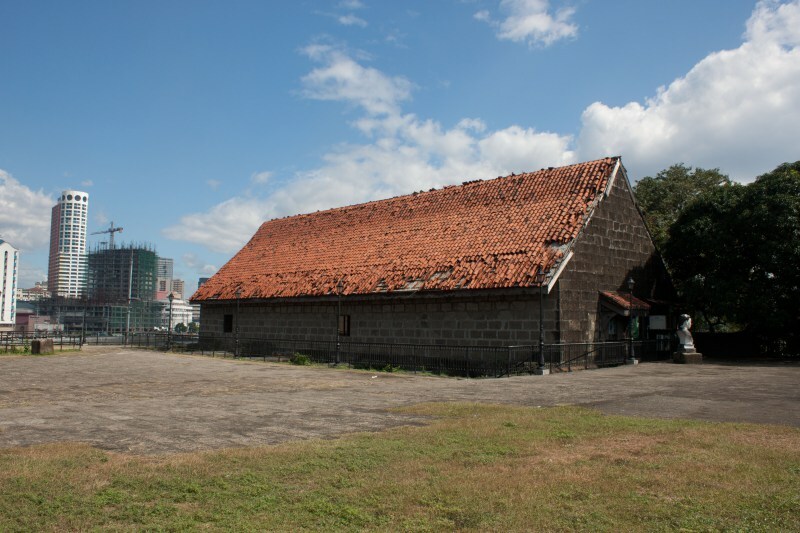 Fort Santiago had been used as a detention center for centuries. Many stories have been told of torture and execution during the Japanese occupation by the notorious Kempei Tai, secret military arm of the Imperial Japanese Army. However, these stories are not unique in the annals of the fort’s history as explained by George A. Miller in 1906, “Interesting Manila”. “There are all sorts of stories floating about the old fort. So far as the walls are concerned, there is some foundation for the stories. There are storerooms and magazines, and the outer curtains are connected with the main wall in some cases by underground passages, or were, before these tunnels were destroyed. The filling of the old moat closed them, probably forever. When the wall at the end of Calle Aduana was removed, the inner chamber was found filled with human skeletons. There were however, underground passages and deep-built cells in the fort itself. 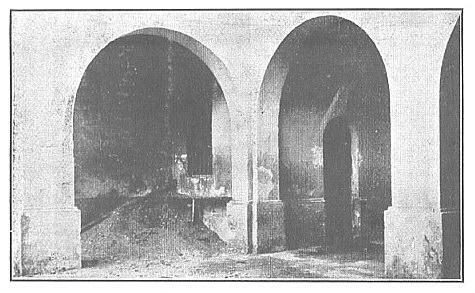 When the Americans took charge of the place (in 1899) there was no opening in the wall where the large stairway is now located on the river face, but from the large room now used as a magazine there was a circular well just under the new stairway. This well was entered by means of a series of winding stone steps, and led down to a passage considerably below the level of the water in the river. This lower passage led back from the river and was lined on each side by cells which could be closed from the front and which were so low that it was impossible to stand in them. There was also a movable gate by which the water could be admitted from the river, and all the evidence pointed to the use of these cells for purposes of “unintentional” executions of persons whom it would be expedient to have out of the way without open trial or public capital punishment. The natives have a terror of this old place and have no desire to see anything below the surface of the walls. Jose Rizal, the national hero of the Philippines, was incarcerated in one of the barracks of Santiago on the last week of December 1896. He was executed on December 30th. His death sparked the revolution of independence against Spain. As he sat in his cell, Dr. Rizal wrote a final letter to his dear friend, Prof. Fernando Blumentritt. 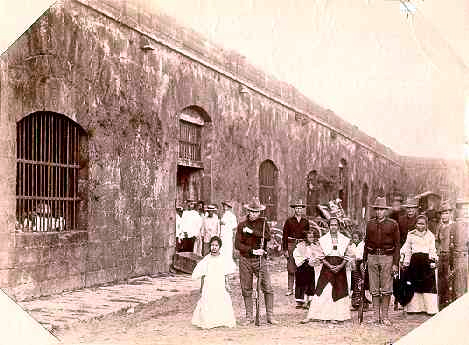 As the United States purchased the Philippines from Spain for $20 million per the 1898 Paris Treaty , the U.S. military quickly took over Fort Santiago as their headquarters, installing the infantry in the barracks within. Years later, on July 26, 1941 the United States Army Forces in the Far East (USAFFE) was created as a military formation of the United States Army with Gen. Douglas MacArthur as commander. His headquarters was located at No. 1, Calle Victoria. After many years of slow growth under Spanish rule, the new era of the American colonial period seemed fresh and positive. The architect Daniel H. Burnham secured an appointment to the Philippines in 1904 as a member of the Philippine Commission. Governor-General W.H. Taft offered him the prospect of preparing plans for Manila to make it “the Pearl of the Orient”. The bay front was planned to be the hub of social life with a new hotel located on the northern side of Luneta Park. 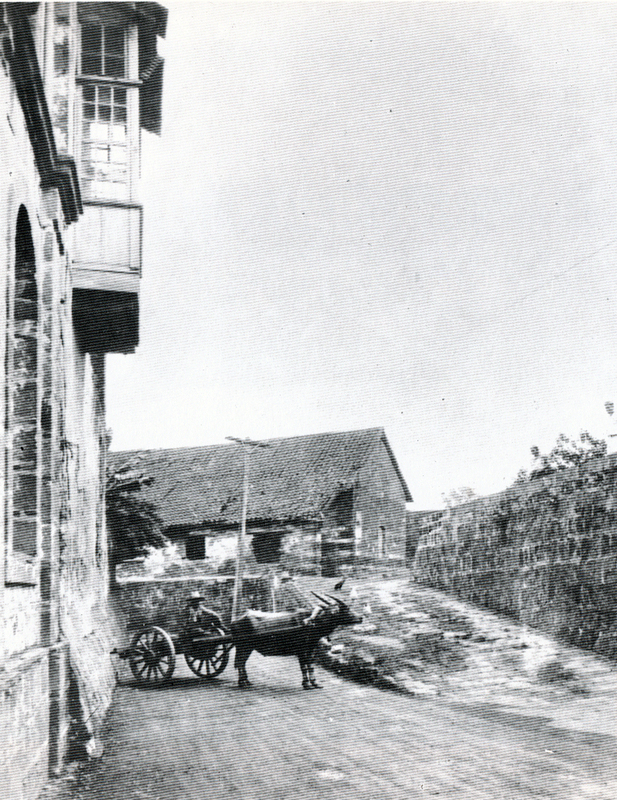 His plans included piercing the Intramuros walls to have new gates for the streets that would pass through. The surrounding moat that had become stagnant was to be eliminated for aesthetic and sanitary reasons and filled up to become sunken gardens and play fields which were then turned into the municipal golf course. When the Japanese invaded the Philippines, the Kempe Tai (Military Police Corps) was the military police arm of the Imperial Japanese Army which entered and occupied Manila on January 2, 1942. 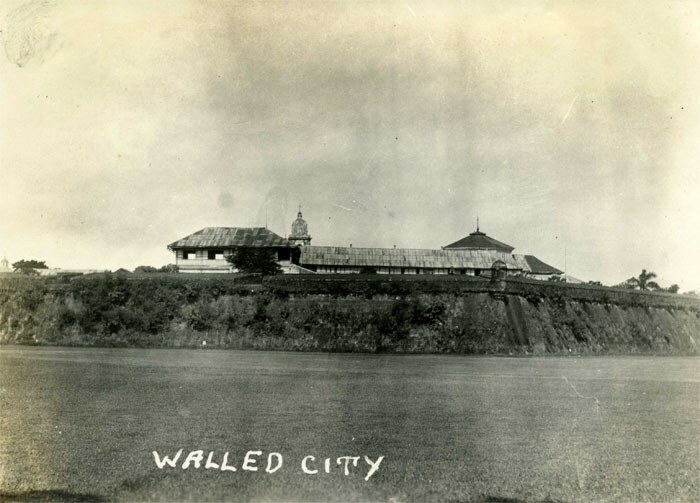 As soon as they entered the city, they immediately set up the headquarters of the Philippine Kempei Tai Unit at the Jai Alai Club and on January 11, 1942, it was moved to Fort Santiago under the direction of Major Kazuo Nishimura. There were several reputed Kempei Tai prison centers around the Philippines. Among these centers, Fort Santiago (known as the “Bastille of Pasig”) was the biggest and most well-known detention center with at least 12 dungeons or prison cells. 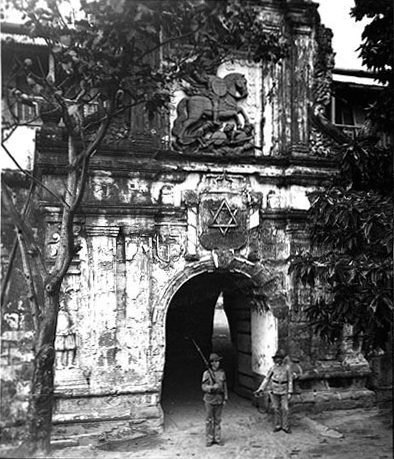 During the occupation, many Americans and other Allied civilians as well Filipinos were imprisoned within the dank walls. No one, regardless of social status, rank or prominence was immune. Eulogio Rodriguez, Sr., Tomas Morato (mayor of Quezon City), Manuel Elizalde, Elpidio Quirino, Jovito Salonga, Jose Buenaventura and Raul Manglapus. All were eminent Filipinos. It was documented through accounts and testimonies that a suspect would be arrested late at night, had their belongings confiscated then followed by intensive interrogation, beatings and finally, torture. 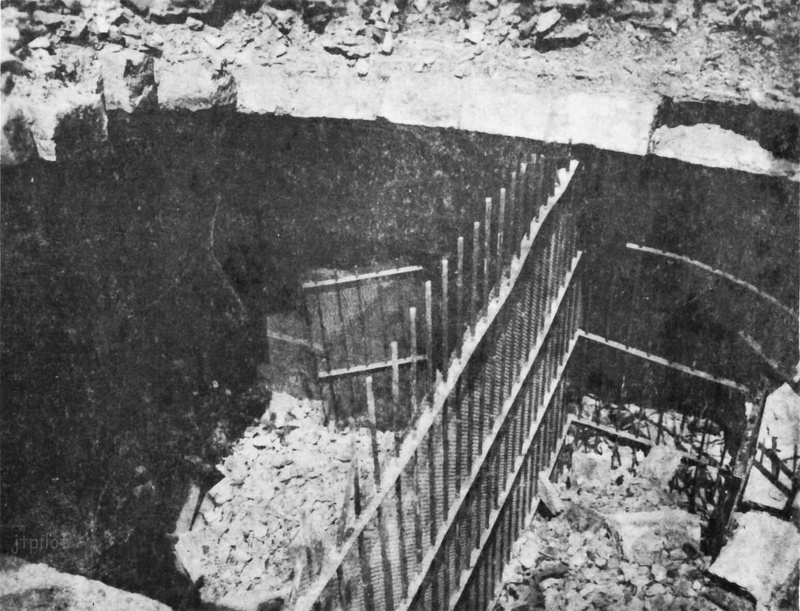 Below, one of the dungeons discovered after the Battle of Manila. Frank Stagner was just 9 years old when he, his sister and brother, mother and father were rounded up and sent to Fort Santiago in February 1942. Stagner’s dad had worked at the RCA Communications office before the war and was interrogated by the Japanese. Here’s the interview we took with Frank where he describes his terrifying two week experience at Fort Santiago. The family was then sent to the Santo Tomas Internment Camp until they were liberated in February 1945. Your comment means a lot to me. It’s heartening to know there are so many people who have expressed an interest in the landmarks of Manila’s history. thank you so much for all you are doing about manila. do you have anything about san juan, little baguio where i grew up. my eldest son is so interested in everything you have noted down that he takes the computer to his bedroom and enjoys reading and looking at the photos of manila. Please continue as you bring so much joy and memories of my childhood. My boys could not believe how Dewey Blvd looked, how clean it was. Dear Carmen, I’m thrilled that the younger generation takes an interest in our history. Manila is a beautiful city and it would take just a little more effort to care for our heritage. It is people like you and your sons that will make a difference. Thank you for writing about your boys. It made my day ! Carmen del villar Green – I know of a book narrating life in old little baguio/broadway, it’s entitled The Manila We Knew. You may want to look it up. Thank you so much for sharing these historical treasures. I am deeply greatful to your enthusiasm in sharing pieces of Manila that remind us Filipinos of our glorious past. Sir, we may not know each other personally but it is as if the City has introduced us and made us friends for a long time. Thank you so much. Godbless. Your account of Fort Santiago brought to mind my grand father Celerino Gatchalian who was incarcerated in Fort Santiago at the close of WWII. I last saw him in his home in Intramuros when my father, my younger brother, and I said our good byes to him on our way to Malabon from Malate. It was indeed a sad moment for my family. I Came across your comment randomly looking for info about my family. I think your Grandfather is my Great Grandfather. His name was Celerino Gatchalian and he had 4 sons, Celerino Perfecto (my Lolo), Jose, Antonio (many of us are named after him! ), Ramon & Angel(?) and 1 daughter (can’t remember her name). Is He lived in Intramuros and died at the hands of the Japanese towards the end of the war. I assume this is him? I would love to hear from you if this message reaches you! Not sure how this works, but you can find me on Facebook! I found the history of Intramuros quite fascinating,however, since I am from Cebu City I wonder if there is anything similar to it,specially about the American era and the Japanese occupation. During the war we lived just about 50 yards from the house where the Japanese High Command lived,and about 30 yards where they entertained themselves at night (at the old “Casino Espanol” -which has now been totally replaced by a new and much bigger building).After the war we went to school at the “Cebu Normal School” (now “Cebu Normal University”),which was used as a prison by the Kempei Tai during the war. I sure would like to know more about all those years,specially since todate I am surprised why the house where the Jap.High Command lived (and neighbour of ours!) was never bombed! Many thanks for any info. Thank you for writing Andrew. You pose interesting questions which bear more research. Very nice blog! Thank you! Thank you for the pictures and the well-written articles that go with them. I live in Quezon City but work in Santa Cruz, Manila. The traffic is often bad, so I thought, why not learn about the history of the places that I see everyday? It gives a new and much better perspective to daily life, as if I am a tourist on vacation. Wow. I love Manila and you just made it more meaningful to me. I love the old pictures you’ ve posted and the stories behind them. I love seeing Intramuros everytime I pass by the area. Although one thing that saddens me is the general condition of the entire place itself. I hope this entire district can be given enough attention and be restored to its former beauty. Excellent blog. The kind that is worth reading. Thanks a lot. Hello and god bless you. I was born in the late 60’s but I’m still mesmerized by old Manila. How I wish I could go back in time and relished the beauty of our past. Thank you very much for the pictures it gives me the pleasure to enjoy how beautiful Manila was. More power and good health always. Thank you so much for this info about Fort Santiago..
I’m almost 20 and a Bicolano..I have always been fascinated by Intramuros and other historical places here in our country..It’s just so sad that some people take these places for granted as just mere spots to visit without even learning more beyond what the eye can see..I was very curious of what’s underneath Fort Santiago and hoped that it would also be open to public, but well, you know some people just aren’t disciplined enough to preserve historical sites..And I suspected that the underworld of Intramuros, although fascinating would definitely have a very grim past.. Thank you so much for having this online and for keeping our history alive..
It’s satisfying to know that there are many of you in the younger generation that are interested in our history. I also hope the next generations will maintain that interest. Thank you for your comments ! Enjoyed your website. Wondering if your research showed reason for use of the Star of David at the Intramurus Gate? Is it also at the time a symbol accepted by Christianity? That’s a good question. It was a much discussed topic in my Facebook Manila Nostalgia group however no one could come up with any research to explain it so it remains a mystery. Am very fond of stories or information that may somehow fill-in the gaps about our nation’s past, as a licensed and professional tour guide, and a very ardent student of Philippine history, your efforts have have further inspired me to look for more answers from sources here and abroad so as to somehow complete the picture. As it is, Philippine history has so many missing parts and suffers from a lot of inconsistencies. I pray that you will continue to “dig” some more that I may share these hidden or lost stories Filipinos and our foreign guests are simply aching to hear. Please continue the good work!